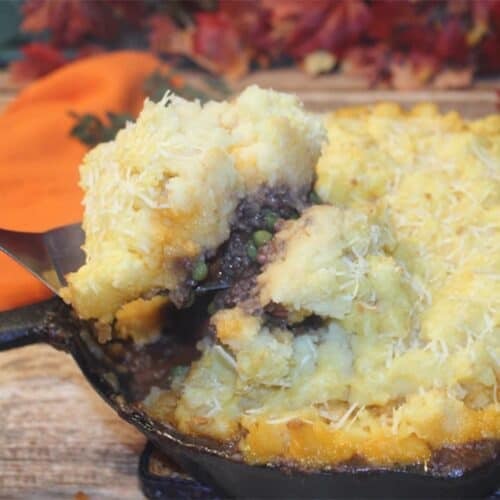 One Skillet Shepherds Pie is not only quick & easy to prepare but quick & easy to clean up too! An all in one dinner complete with vegetables, meat and potatoes that will fill any & all bellies. Heat oil in large iron or oven-proof skillet. Saute carrots about 5-6 minutes or just until they start to get tender. Add onion and continue to saute for another 2 minutes. Add beef, seasoned with salt, thyme (or rosemary) and black pepper, and cook until done. Drain off fat. Return to medium-high heat and stir in flour until sauce is smooth. Add tomato paste, Worcestershire sauce, peas, wine and broths. Bring to a low boil and let reduce down to a thick gravy. Top with a layer of mashed potatoes. Brush with beaten egg and sprinkle parmesan cheese over top. Bake for 20-30 minutes or until top is golden brown.